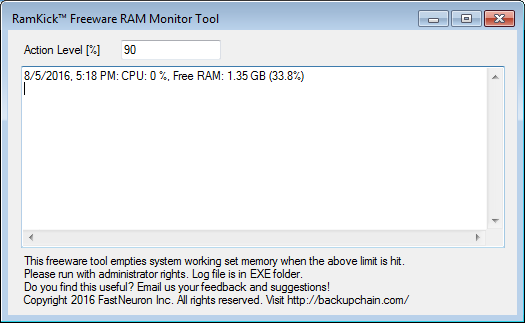 At BackupChain there is a new freeware tool (check the free tools section for more stuff!) you may be interested in. RamKick is like RAMMap, which many people use to clear the metafile in Windows. As we all know, the metafile can be quite a RAM eater. And once it gets to over 95%, server performance is down the toilet. Use RAMKick and simply let it run. It will free the system working set when the action level is reached and log everything. It also logs CPU and RAM as well into a text file so you know what is happening when you’re away.